Twitter integration will allow you to have a “Send to Twitter” option for your photos. This would use the still-to-come Twitter-owned photo service. But wait. That’s it? Surely not. No. Not even close. I think that we have to look at something far larger than just being able to send photos to a social network from the Camera app. If we’re going full system-level integration, there are many other pieces of the puzzle that start to fall into place. We’ve already seen Apple and Twitter team up to integrate iTunes Ping into your Twitter stream. But Apple won’t be happy with a single integration into Twitter’s sidebar. 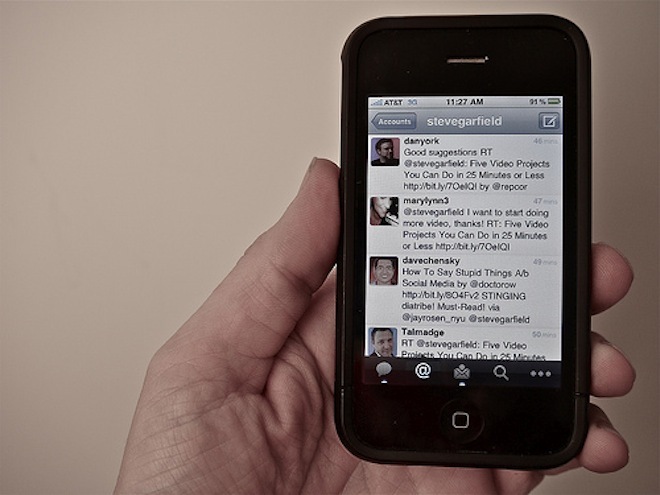 There’s much more to an impending social play and Twitter is the way to move that forward. First off, Twitter’s move toward forced oAuth for Direct Messages makes a lot more sense. I can’t imagine that Apple would accept anything less and probably had a heavy hand in order to work together with Twitter in the future. So once you have direct Twitter integration to your contacts list, you would be able to pull in Twitter avatars for contact photos, much like the integration with Android and Twitter. Touching a contact would allow you an option to tweet to them, rather than just the option to call, text or email. Now let’s take that a step further. If there’s system-level integration, you could get a Rapportive-style piece of social information from the Mail client. By the way, if this happens to be the case, Apple needs to buy Rainmaker, and it needs to happen quickly. Let’s say that you just took a photo of a friend. Now you could tag that photo directly, then upload it to Twitter’s forthcoming service. These are things that we could see coming soon. Beyond that though I think that there’s still more. Perhaps this is an integration with the forthcoming iCloud, but I could see those photos being sent to a cloud service, quite like MobileMe, where the photos that you’ve uploaded could be browsed and would include social tagging. If you have full Twitter integration then it opens the door to have social hooks built into every single application that ends up on the iPhone. But let’s start with the native iOS apps first. Listening to a song? You can tweet that out directly. Find something great in iTunes? Send a recommendation over Twitter to the friend of your choice. Have a reminder set in your Calendar? You could set up a direct message to a Twitter user who follows you to tell them where you’re meeting. These are just a couple of ideas, but that base-level hook is what’s really important. Instead of having to rely on third-party services to make your app social, direct integration could completely change the game. In short, these are just a few of the things that system-level integration of Twitter could bring. Apple has wanted to do social for quite some time, and has touched on a few pieces here and there. But wrapping its arms around an already-successful network is just a logical thing to do. It’s the Apple thing to do — Let someone else iron out the creases, then come in behind and just do it better. Read next: Matt Cutts: Your newsletter won't affect your search rankings after all.